Seriously? 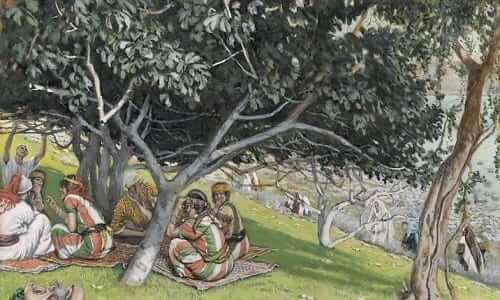 Did Nathanael really come to know and profess Christ as the Son of God and the King of Israel simply because Jesus told him that He saw him under a fig tree? It appears so. But obviously there is much more going on here. First of all, it’s important to look at Jesus’ initial comment about Nathanael. Jesus says that “There is no duplicity in him.” In other words, Nathanael was an honest, truthful, sincere and straight-forward sort of man. What you see is what you get. What a great quality! Secondly, we can see that this straightforwardness leads Nathanael to profess his faith in Christ almost immediately. How is this the case? Was it something that Jesus said? Clearly it was something much deeper that led Nathanael to profess his faith in Christ. It was a spiritual gift of faith by which the Holy Spirit revealed this to him. The good thing is that Nathanael, being a man without duplicity, listened to the Holy Spirit speak to his heart and he then spoke this conviction openly and with transparency. What a great quality to have when one is also open to the truth. In our own lives we need to imitate this quality of Nathanael. We must be open to the Holy Spirit speaking to us, and we must then be confident and honest in the convictions placed in our hearts so that we can reveal them honestly and openly to others. In imitating these qualities, we will also be able to act as instruments of our Lord to all whom we meet. Reflect, today, upon this intriguing encounter between Jesus and Nathanael. How open are you to the voice of God speaking to your conscience? And how ready are you to share your gift of faith openly and honestly with others? Commit yourself to being an open instrument of the voice of God in this world in imitation of this great Apostle. Lord, I desire to hear and know Your voice speaking to me in my conscience. As I hear You, help me to be ready and willing to reveal You to others. Jesus, I trust in You.